At mYofocUs we use a number of techniques to help achieve a beautiful and functional smile. Oral Myology a.k.a. Oral Myofunctional Therapy is a term used to describe the coaching we provide in order to help children to improve their oral posture, and swallowing function. It has been shown to have positive impacts not only on the dentition but also on sleep. 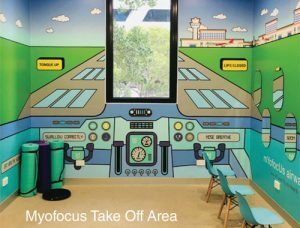 At mYofocUs we have our ‘Take Off’ area specially designed to deliver effective myofunctional changes. DOWNLOAD GUILLEMINAULT ET AL PAPER – Oral Myofunctional Therapy has been shown to help in treatment of sleep apnoea as well as improving jaw growth. 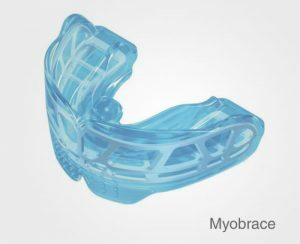 Myobrace appliances are used 2 hours each day while awake and every night while asleep. They help children to learn to swallow in a better way and in doing so, promote better jaw growth and development. They all guide the erupting teeth into position. Teeth and jaws are much like a lump of clay in a growing child, while the tongue, lips and cheeks act rather like the sculptor. Better swallowing function leads to more favourable forces on the teeth and jaws. Better function leads to better form. For more information, please contact mYofocUs team. 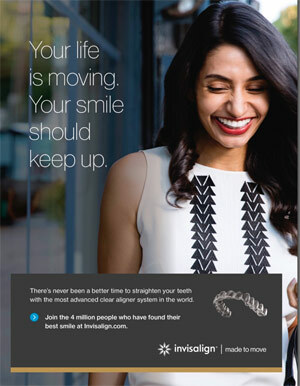 If you are seeking to discretely straighten your teeth, then Invisalign® could be for you. It is the clear alternative to braces, with aligners that are virtually invisible. Hence, most people would not even notice that you are straightening your teeth. There are definite additional advantages of Invisalign® over braces, including being easier to maintain better oral hygiene, and you can remove the aligners for special occasions. There is practically no interference to an active lifestyle, and more predictable treatment time length, with a significantly more comfortable feel, and fewer doctor visits are usually required. At Myofocus, we combine Invisalign® treatment with orofacial myology, so the teeth can be straightened and the functions of the orofacial muscles corrected simultaneously. Consequently, the result can be more stable in the long-term, since we attempt to address some of the causes of crooked teeth. Our practice also uses the technologically advanced digital scanner, iTero, which integrates with Invisalign® to make the entire process much easier, without the need to take uncomfortable mouth impressions. Since its invention over 20 years ago, more than 4 million people worldwide have undergone the Invisalign® treatment, and this number continues to grow. At Myofocus Melbourne, Dr. Donny Mandrawa, is an Accredited Invisalign® Provider, who can assess if you are a suitable candidate for this state-of-the-art orthodontic treatment. We focus on ensuring that the original causes of the crooked teeth have been addressed to the best of our ability. The food you eat can affect how healthy you are. The more healthy you are, the less likely you will have a blocked nose. A blocked nose leads to mouth breathing, and resultant low tongue posture. Low tongue posture leads to a narrow jaw… So staying as healthy as possible is very important when trying to grow healthy jaws. We will give you as much advice as we can to help guide you towards healthy eating habits. Or, if necessary, we may refer you to a qualified nutritionist, or dietitian. If all of the right conditions are in place, a plant will grow strong and towards the sunlight. The human body is not much different. At the end of the day, we want you to grow into the most healthy version of your self. To do that, the conditions need to be just right. At mYofocUs, we aim to provide the perfect conditions, for healthy growth. Healthy nutrition, breathing function, and movement are the mYofocUs recipe for healthy growth. Your habitual oral rest posture and the way you swallow changes the amounts of force exerted onto your teeth and jaws. Swallowing patterns may be adversely affected by tongue ties, use of bottles, or dummies as an infant, or toddler and by soft sloppy diets. The lips, cheeks and tongue need to work correctly in unison in grow healthy jaws, and deliver beautiful smiles. We will assist in changing oral function for the better, by providing you with a mYofocUs Exercise Program, designed especially for you. Effective and frequent movement is essential for physical wellbeing. Physical wellbeing improves your overall health in so many ways, and frequent exercise has been shown to be essential for wellness. We need you to stay healthy to help keep your breathing patterns on track. Plus, we want to help you to be as healthy as possible so you can enjoy your life to the fullest. Part of the mYofocUs Exercise Program involves improving your core strength, which not only helps with efficient movement, it also helps you to breathe better, using your diaphragm. The way you breathe can affect how healthy you are. Without warming and filtering the air through the nose, cold, dry and dirty air passes into your body. This can cause inflammation, leading to enlarged adenoids and tonsils, and recurrent respiratory infections. We will give you lots of fun exercises to help you to establish healthy breathing habits. If necessary, we may need to refer you to a qualified allergist, or Ear Nose and Throat specialist.